While there are thousands of magazines published every month, not all of them are worth money and time to spend after based on one’s interests and favourite topics. Also, the substance in the content is very important. Entertainment oriented magazines are good to refresh the mood and kill time, but ultimately, science and knowledge oriented magazines are actually worth the time we spend for it. Safari is one such magazine and thus I am eagerly waiting for its latest issue every month. So here are my personal views and reviews for the August 2017 issue of Safari, a Gujarati magazine. Let us start with the cover page. 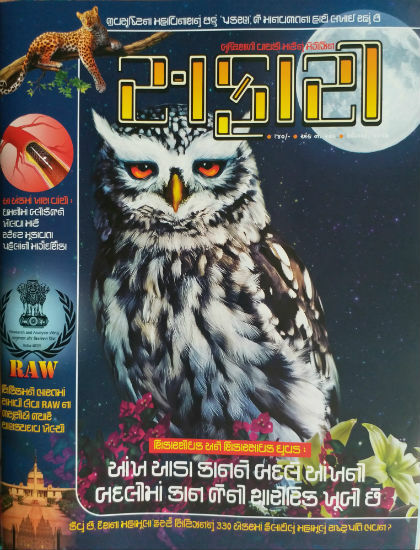 A large area of the cover page is occupied by the photo of an owl gives it a look of nature-oriented magazine. In that sense, the cover page matches the name of the magazine. We can give “good” rating to the cover page. Owl’s ears work as its eyes! As we can assume correctly from the cover page of the magazine, there is a detailed article about Owls. While it talks about owl as species, it focuses mainly on owl’s ability to find its food in dark. Naturally, eyes will not be of much use when it comes to darkness. If there is no light, there is no way one can see the object. We know that owls come out at night due to its characteristics, and they need to hunt for the food during darkness only. And rats and other such species which serve the purpose of food for them, are really tricky ones to capture. Hunting for a moving or running rat during extreme darkness is a very tough job and as eyes would be of no use, nature must have presented owls with some special abilities, right? Mother nature had blessed owls with unnatural ears. If you are interested in nature-oriented stuff and love to explore special abilities of various species to see how diverse the life on the Earth is, this article is really worth reading. We often see articles related celebrity homes and their uniqueness in various magazines, newspapers and web portals. People are interested in gossiping about such homes due to curiosity. We often see articles about costly homes around the world. However when you talk about buildings which are used as residential homes and have historical values also, the name of Rashtrapati Bhavan comes on top due to various reasons. Be it the time taken building it or the efforts made by the architect to make it unique and splendid or the amount the architect was paid for his work, everything related to Rashtrapati Bhavan is unique. A detailed article about Rashtrapati Bhavan is found in this issue. The article brings some unique information and is written in an interesting manner. Some photographs with historical importance embedded in the article add to the positive attributes of the same. The article is published timely as 15th August is celebrated as the Independence Day of India, and Rashtrapati Bhavan is the official residence of the President of India, who is the first citizen of the country. Definitely a worth reading article. Nowadays when hectic schedules and fast lifestyle made some problems almost important part of human lives. Be it blood pressure, cancer or heart problems, they are on rising. It made the research scholars explore even more ways to fight against such problems. The words Angiography and Angioplasty are heard more often than before. Even Bypass surgery is no more an unheard or rarely heard phrase. Well, for doctors, it is nothing other than just another treatment, but patients, especially a layman it is always quizzical that what happen in such surgeries, and/or what exactly it does. There is a detailed article about “stents” in this issue, which is found interesting mainly by only a short reader base. However, it is better to know facts about a stent and its usage. I will recommend it for reading to everyone. We love to talk about MOSAD when it comes to thrilling real life spy missions and commando operations. Actually, almost every major country has an integral such agency which works for the safety of the country from the internal and external sources. India has RAW and some of its operations are unparallel in the world. Sikkim is an integral part of India. But when India got independence, actually British rules left a chaos where there are hundreds of small states and estates were there with their own rulers. Sardar Patel did a remarkable job by integrating these small segments and build the Republic of India. Sikkim was and is a very important State which is located in the east and have shared borders with neighbour countries. CIA and China have had their own interest in Sikkim politics and it was a challenge for India to keep its sovereignty and make Sikkim safe from any and all outside influences. A detailed article exploring historical facts and incidents which made it possible is definitely one of the most worth reading articles in this issue. In Incredible India segment some interesting information about the corals found in the Pirotan island near Jamnagar, and how it can be used for various geographic calculations, is explored pretty effectively. I, however, felt that this could have been a detailed article. The editorial of this issue talks about how Chinese products are securing Indian market and eventually dragging money to their country. While it is important to have a competitive market where our products should match the quality and price according to international standards, it is also important that the money of the country is in no way used against the country itself. In addition, I recommend you to read Q/A and Fact Finder segments. They consider some really important and interesting knowledge. Overall a worth reading magazine issue which gives you much more than its price. A recommended read. The only limitation is, it is published in a regional language, making its reach limited.